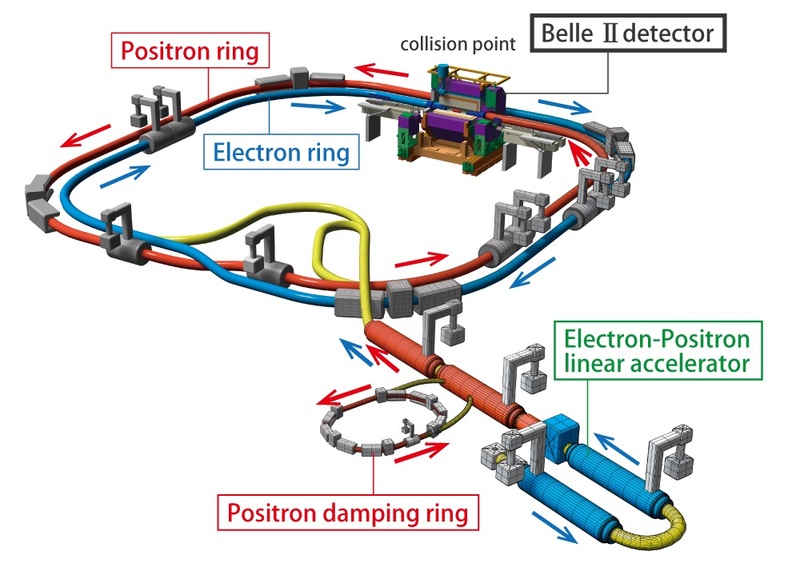 The SuperKEKB particle accelerator at the KEK research center in Japan has recently reached a major milestone: electrons and positrons have been circulated for the first time around the rings. The accelerator is now being commissioned and the start of data taking is foreseen for 2017. One of the core questions to be investigated in these experiments is why the universe today is filled almost only with matter while in the Big Bang matter and antimatter should have been created in equal amounts. Physicists at Johannes Gutenberg University Mainz (JGU) are involved in the development of the slow control of the detector. The group of Professor Concettina Sfienti at the Institute of Nuclear Physics at Mainz University will be working together with some 600 scientists from 23 countries to analyze the data. As the new accelerator is designed to deliver forty times more collisions than its predecessor KEKB, the Belle detector is also being upgraded to cope with the extreme requirements of the modified collider. The German contribution to the new Belle-II detector is a high-resolution tracker that is at the heart of the device and can very precisely record the tracks left by the generated particles. It is accurate to less than half the thickness of a human hair. The team of physicists from Mainz provide the expertise to create the software required to monitor the detector and the readout electronics. This software is used to control the operating parameters of the detector and to continually monitor its efficiency. Although the high collision rate envisaged means that it is necessary to employ hardware that comes close to the very limits of what is feasible and is thus extremely expensive, the flip side of the coin is that this should make it possible to detect rare events. "We have reached an important turning point in the development of the SuperKEKB, an accelerator that will have forty times the luminosity of the most powerful collider ever built. The experiment will supply us with a lot of new highly precise data which may also lead to the discovery of new particles," said Sfienti. Moreover, it is hoped that evidence of very rare events that may have occurred in the early phases of the creation of our universe will be discovered, providing insight into new laws of physics beyond those of the Standard Model.